As a top network solution provider, Huawei LTE Gateways are an important series of wireless products for home or office networking. Huawei B593 is the world’s first 4G LTE WiFi routers with Ethernet port and the new competitors are continuously presented to the public by Huawei in following years. 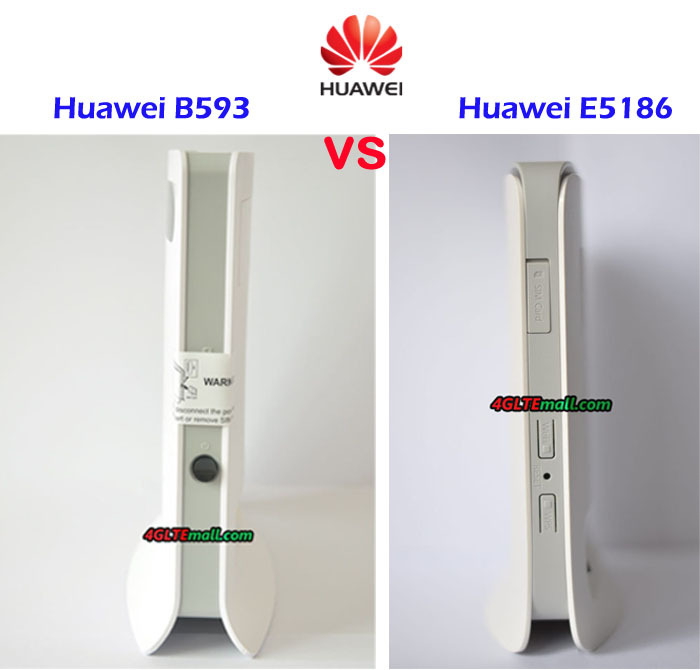 Huawei E5186 wireless router is one of them. 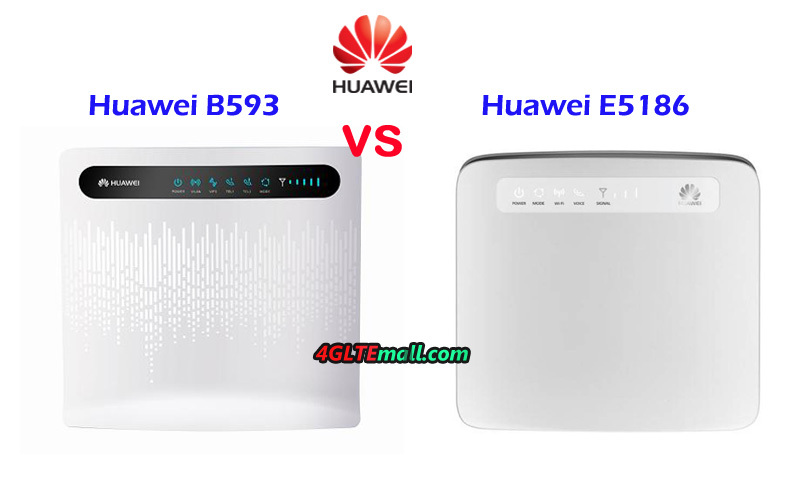 If you want to change the 3G router or ADSL connection to Huawei 4G Gateway, you may ask: what’s the difference between the Huawei B593 and Huawei E5186? Which one is better in performance? In this article, we will review the appearance, interfaces, specs and variant models to provide possible answers for you. 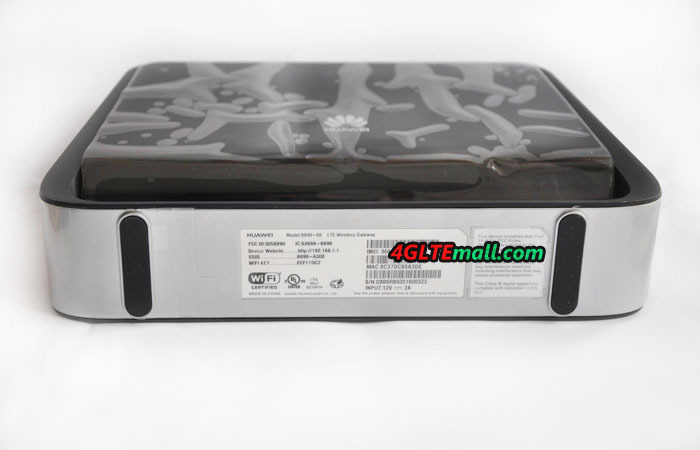 The Huawei 4G Router B593 and E5186 are both the 4G WiFi router with Ethernet ports in traditional router shape. On the front of Huawei B593 LTE CPE, there are some indicators for Power, WLAN, WPS, Telephone, Mode, and Signal. On the Huawei E5186, it indicates Power, Mode, WiFi, Voice, and Signal. Of course, Huawei logo is with the indicators. On the back, they both have two connectors for an external antenna. The connector type is SMA. They can use the same 4G LTE External Antenna. 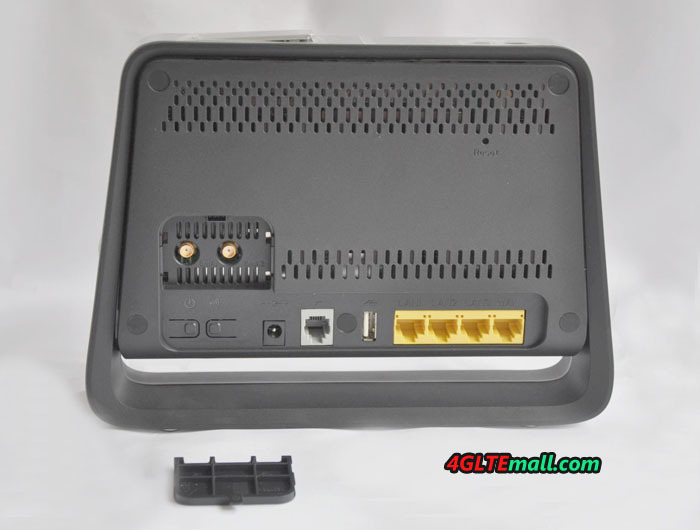 On the back, there is also a line of interfaces, including 4G LAN port(one for WAN/LAN), two telephone port, one USB 2.0 port and power plug port. On the Huawei E5186, there is a power button to switch on or off the power. Huawei B593 power button is at the side of the SIM card slot. 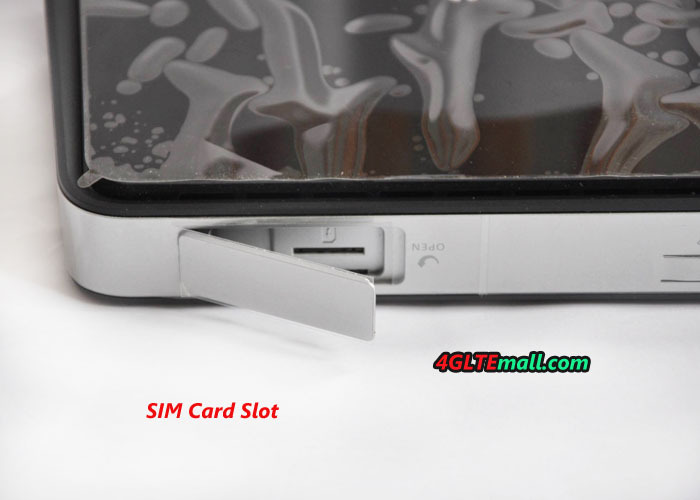 The Huawei E5186 SIM card slot is also at the body side with the WPS and WIFI button. Huawei E5186 uses Micro SIM card while the first generation LTE router B593 uses standard SIM card. From the specs table, we can see the Huawei E5186 is more advanced which could support up to 300Mbps download speed thanks to LTE Cat.6 with 2 x 2 MIMO and carrier aggregation technology. The speed is almost three times faster than the speeds of Huawei B593 router. The interfaces features are very similar in the two Huawei LTE Router with Ethernet ports. Huawei E5186 WiFi router could support maximum of up to 64 users, which is the double quantity of that on Huawei B593 router. 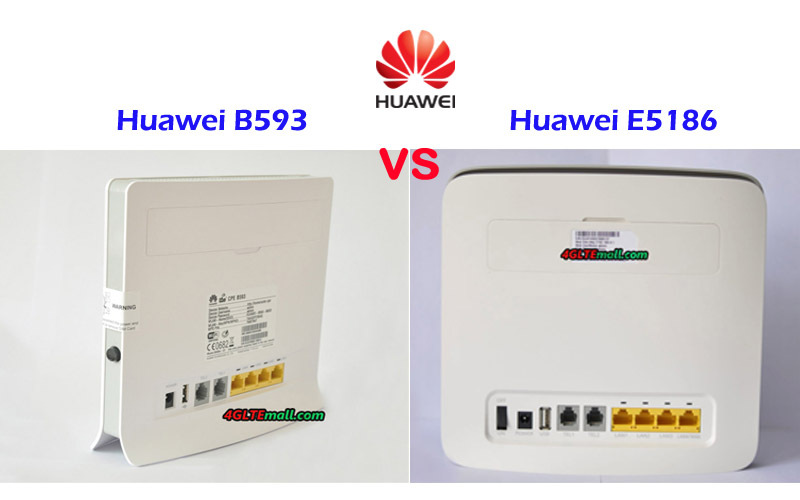 So if you want to buy a fast 4G router, the Huawei E5186 would be the right one. 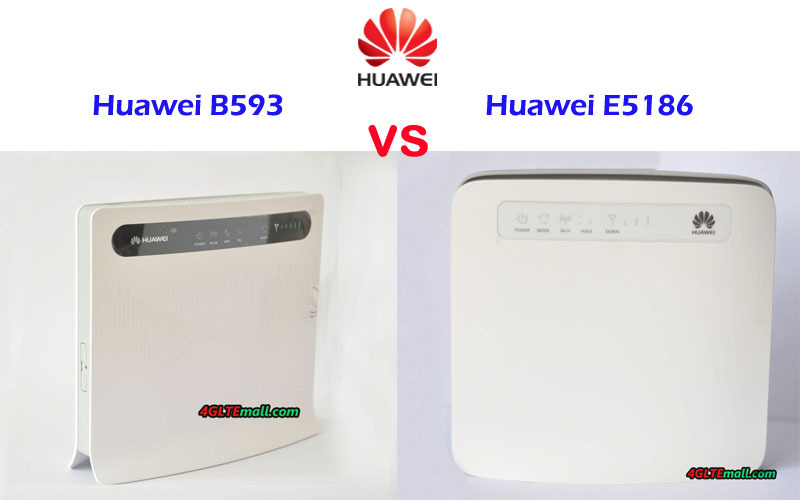 The advantage of Huawei B593 router is that it has many variant models for more LTE frequency bands, if you are looking for a router for specific bands, you may find one in LTE B593 variant models. And the Huawei B593 price is much cheaper than the price when it’s first available in the market. And it’s also much cheaper than Huawei E5186 price. If you don’t have enough budgets for Huawei LTE CPE E5186, then Huawei B593 would provide 4G speed for your internet access. Not everyone is so lucky to get fast broadband at home in past time. But after getting the new 4G LTE Router Huawei B890, there is possibility to enjoy high surfing speed. Huawei B890 LTE Router provides Internet via the mobile network, a solution with 4G in many cases just as good speeds as the fiber experience. In addition, it comes with a clever extra feature. The router is in fact also a DECT base – the technology used in the good old wireless landlines. The base station has in fact higher power than your phone, and then you can carry mobile calls via DECT phone. You can make calls, receive calls, send SMS and do what you could with a regular cell phone. Buy you own SIM card and plug into the B890 router, then you will have your own phone number. The only thing you must remember is that you need a SIM card that also supports voice. Since most subscriptions include free speech, this is not a bad solution. The Huawei B890 Smart Hub is especially useful if there are many people using the phone – for example, children who have not yet own phone, or if the modem is used in a workplace. It also gives you the opportunity to have a private phone in the cabin, boat or home office. If you do not want to spend money on having a separate SIM card or a twin card to the B890 router, you can use the SIM card from your phone, and still be available for talks. DECT phone looks enough like a cell phone, but it works only within range of the base station, max 300 meters. 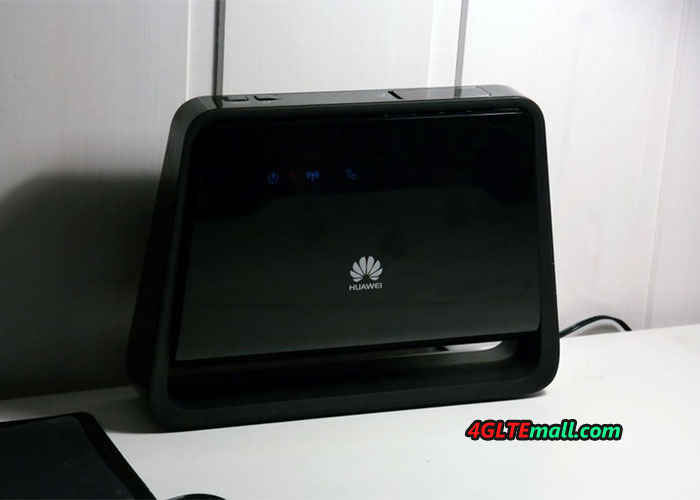 The Huawei B890 router can work in both 3G and 4G, but not on GSM/2G. That means it will not work in areas where you only have EDGE coverage. When you talk to your DECT phone, Huawei B890 modem will use 3G. You can surf and talk at the same time. The B890 LTE Router supports 4G 800 MHz frequency, in addition to 900/1800/2100/2600 MHz. The maximum download speed is 100 Mbps, while the maximum upload speed is 50 Mbps. There are faster LTE Router now, which could support so-called CAT4 modem with max 150 Mbps download, and even LTE Cat6 router which could support peak download speed to 300mbps, and Huawei E5186 4G Router is the first one with LTE Cat6. On the router, there are three LAN ports and 1 WAN port. When the SIM card will act as a backup, the WAN is down. In addition, the router provides a USB port that allows you to share external memory or printers. The wireless router communicates at 2.4 GHz, but not at 5 GHz. This means that the connection can be a bit unstable if there are other wireless networks nearby. For this test, we got us an external antenna to put on the house wall. The external antenna is a 9 dBi 4G panel antenna. It has 4G in the name of course, means that it supports 4G frequencies, but it also supports 3G and 2G. But the Huawei B890 router does not support 2G. It only weighs half a kilo, and a mounting bracket makes installation easy. The antenna is directional, so it is advisable to inform about where the signal is strongest before installing it on. Best is to place the antenna as high as possible, especially because the highest frequencies attenuated lot of vegetation or house walls. The antenna comes with two five-meter long antenna cables, which could connect directly to the back of the Huawei B890 router. Our first attempt was to wander around inside the cabin to find out where the coverage was the best. It turned out that on a couple of points in the living room got symbol H+ on the mobile screen. We measured download speeds up to 13 Mbps; sometimes, the peak speed could reach 25Mbps. In our test, Huawei B890 wireless router operates fairly undisturbed by other networks and we witnessed 802.11b/g/n (at 2.4GHz) as sufficient. With the Huawei B890 4G router, we can also follow what happens in the cabin, via IP cameras connected to the wireless network. This works fine on 3G. There is no problem to flow TV2 Sumo or Netflix in HD quality to your TV, as long as you have enough data available on subscription.